September was the third and final month of our Summer of tent camping, and we spent it in Glencoe, Scotland. To be honest, it was an overall damp and chilly experience, but we have to admit that when the clouds parted, the scenery was pretty good. Our two year old certainly seemed to enjoy herself, even if she wasn’t always keen to stay in her sleeping bag at night. If we went again, we’d probably go in the Spring (which we’ve heard is lovely), and we’d stay in one of those camping pod things we’ve seen around. Anyway, here’s everything we’ve written so far about Glencoe, Scotland. This is our review of the campsite we stayed at for the month of September while we were in Glencoe. Of course, there’s no accounting for the weather, but go ahead and read about how the campsite itself treated us on the last month of our summer of tent camping. This post is an overview of our Summer in Scotland, which we divided between three Scottish campsites. We spent July in Dunbar, August on the Isle of Skye, and September in Glencoe. In this article we go over why we chose to travel like this, what it was like tent camping with a toddler, and what we learned from the experience. Three months is a long time to be “roughing it,” and there were about as many ups and downs as you might expect. Glencoe is a quiet and beautiful place, popular with hikers and nature enthusiasts, but not too far from the comforts of civilization. That being said, by the time we got there we were tired from having already been tent camping for two months strait, and it was cold and it rained almost the entire time we were there. It seemed like an epic meltdown was imminent until we figured out that a change in our perspective and our behavior was all we really needed to finish our Summer with a smile. This post is about our inspiration, and the change we made. 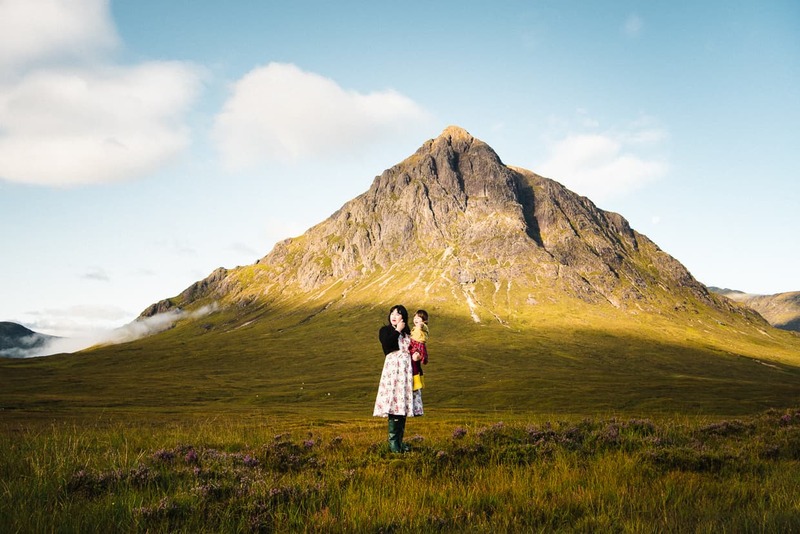 This post is a product review, but the photography is all from Glencoe, and it’s worth checking out even if you aren’t interested in baby carriers (but honestly, who isn’t? ).